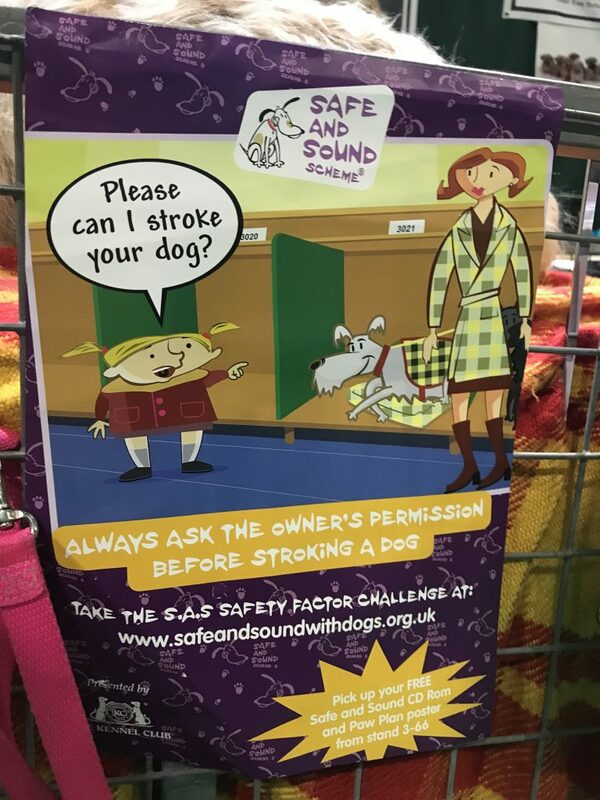 It’s no secret that we are dog lovers. Although we are living a travel dream, we desperately miss our furry companions (thanks, Mom and Jim!). 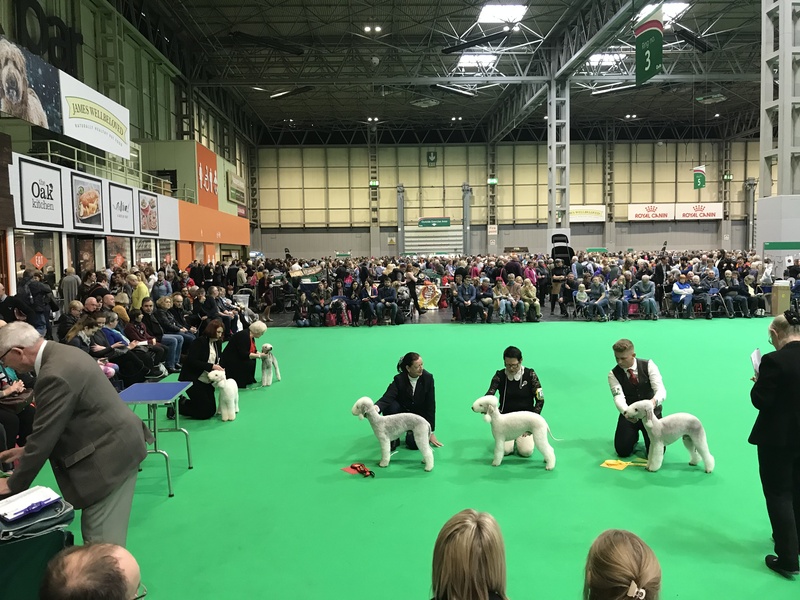 As canine folks, we’re big fans of watching the Westminster Kennel Club dog show on American TV in February, and it has always been our desire to experience such a spectacle in person. 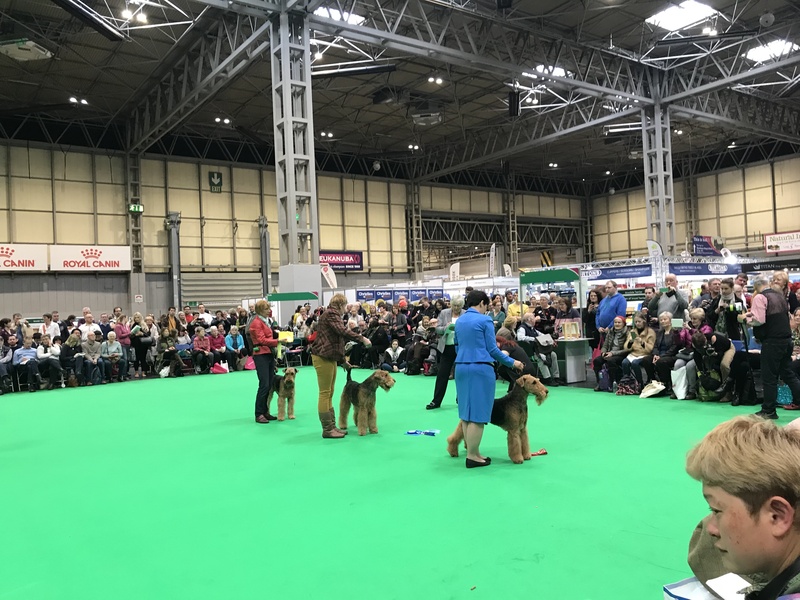 Last March, we did one better and took a trip to Birmingham, England to see what is arguably the mother of all dog shows: Crufts. 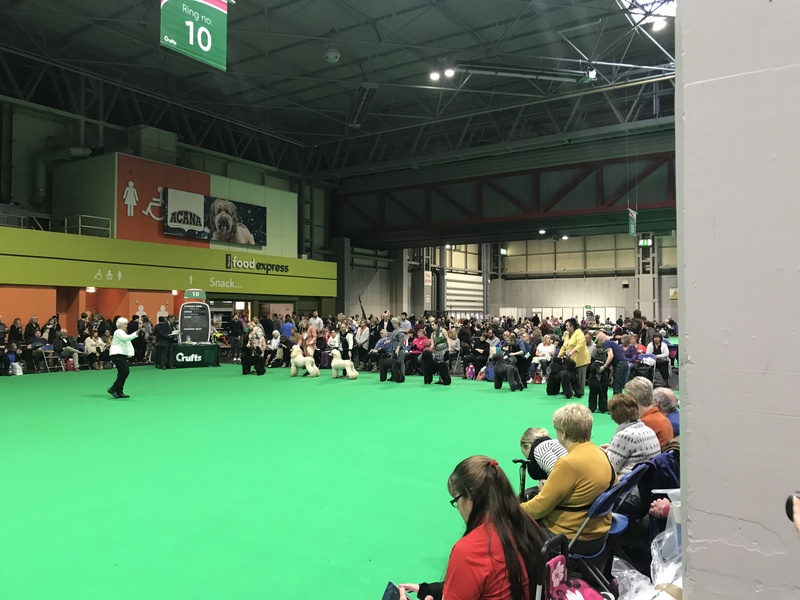 Billed as the largest dog show in the world, Crufts is where the Westminster winners go to compete again for Best in Show. 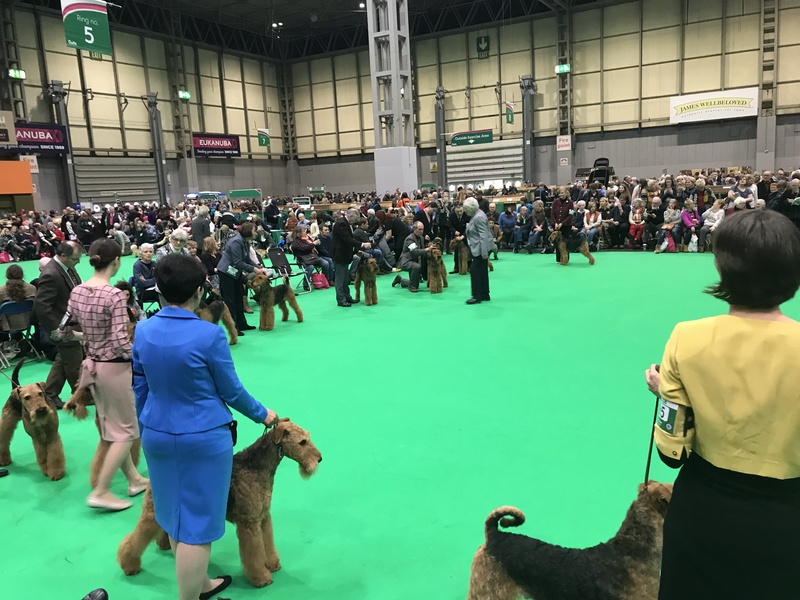 We made our way through the massive exhibition space, picking and choosing what we wanted to experience (see Airedales above). 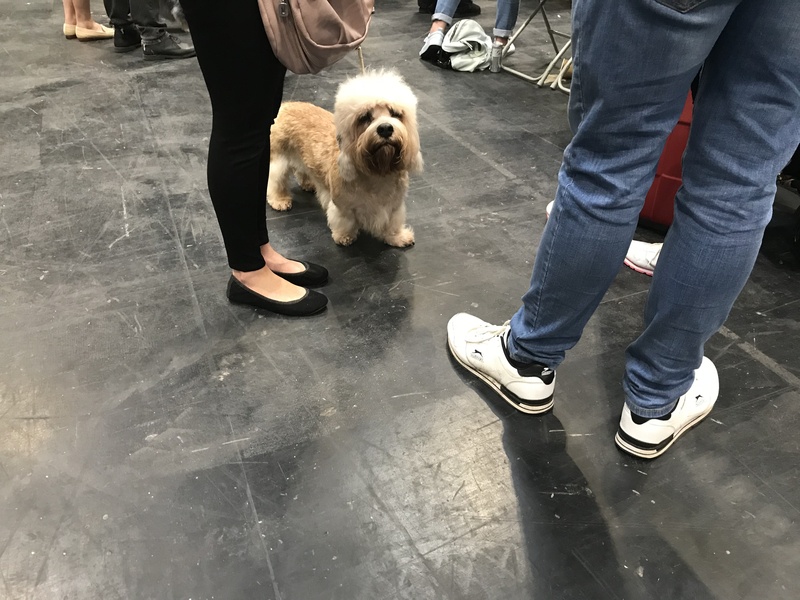 Though there were halls and halls of vendors, we largely skipped the exhibits, gravitating instead toward “our” breeds as well as some others we were curious about. One must choose which days to attend the show based on the groups being judged. 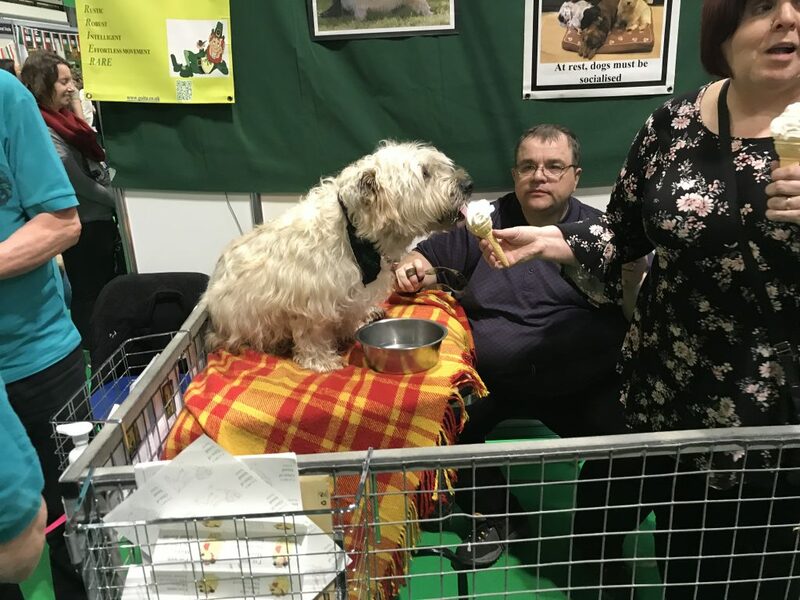 Again, we sided with our breeds and picked Terriers and Toys. 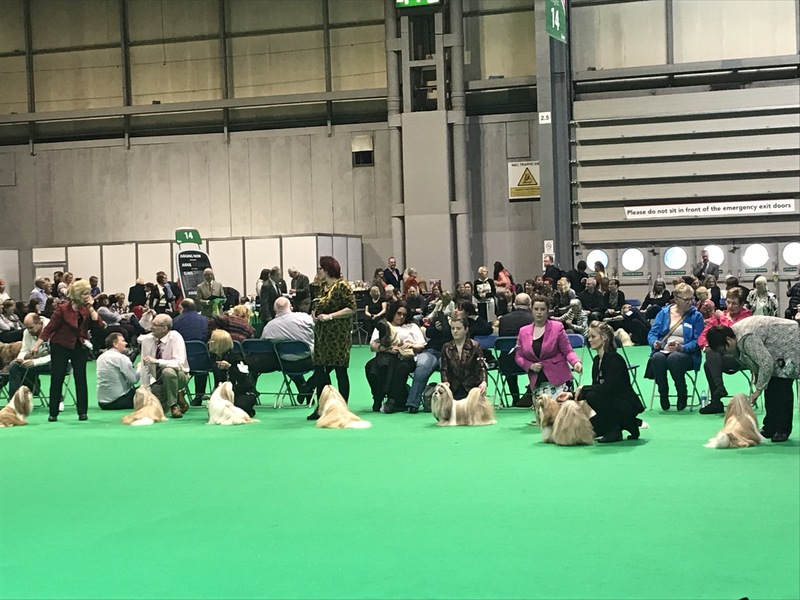 We quickly realized we were not alone in gravitating toward our breeds, as we heard and saw other people texting loved ones, “look at all the [insert dog name here]s!” Crufts was truly a paradise for dog lovers. Look at all the Reggies. Look at all the Tequilas. 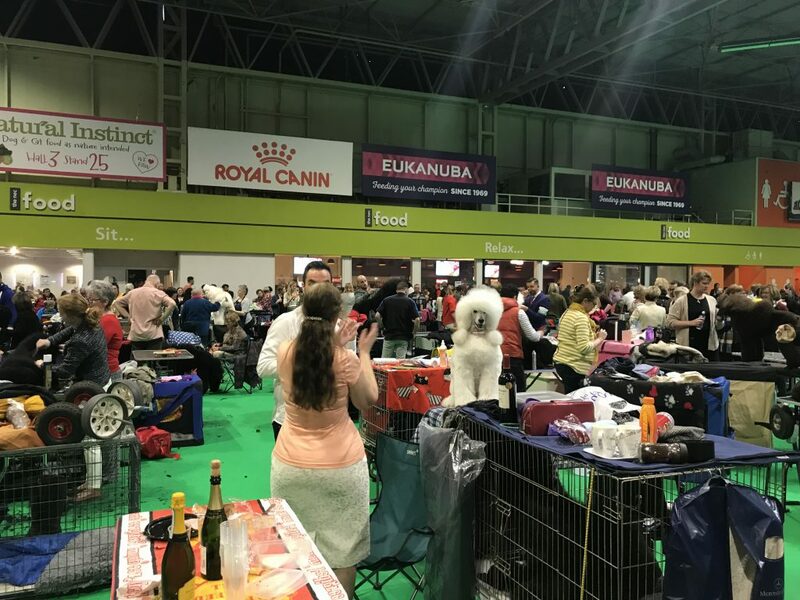 There were other events besides the main breed judging. 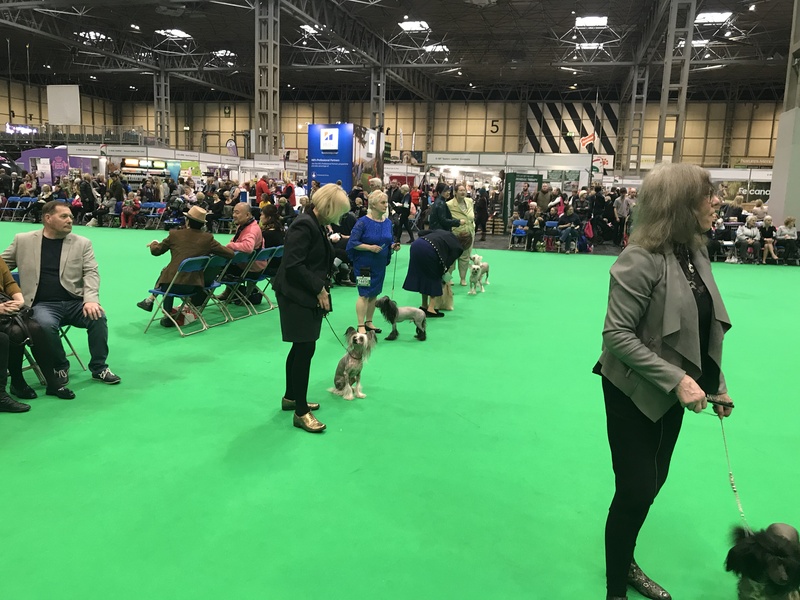 The most bizarre was one where ladies wearing matching outfits paraded identical dogs around. Wish we could remember what it’s called! 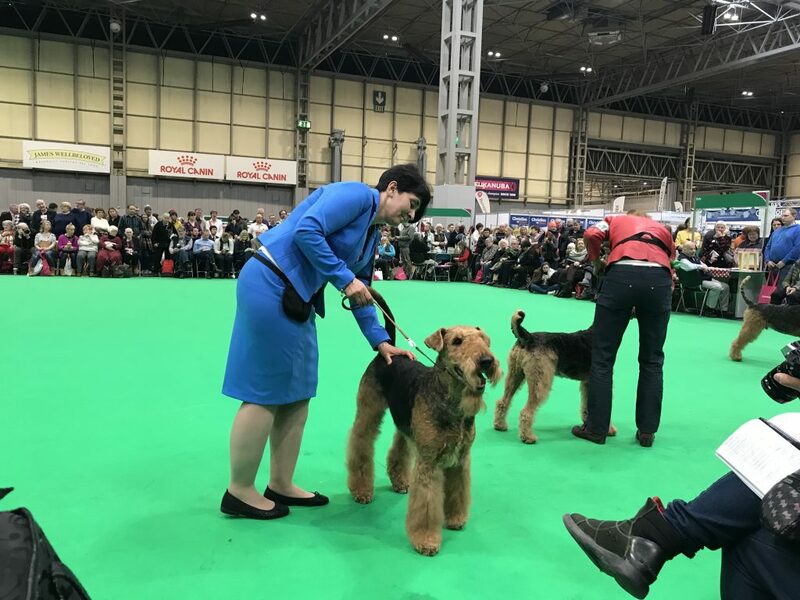 Basically, the identically-dressed handlers walk in a synchronized presentation with 3-4 dogs from the same litter. 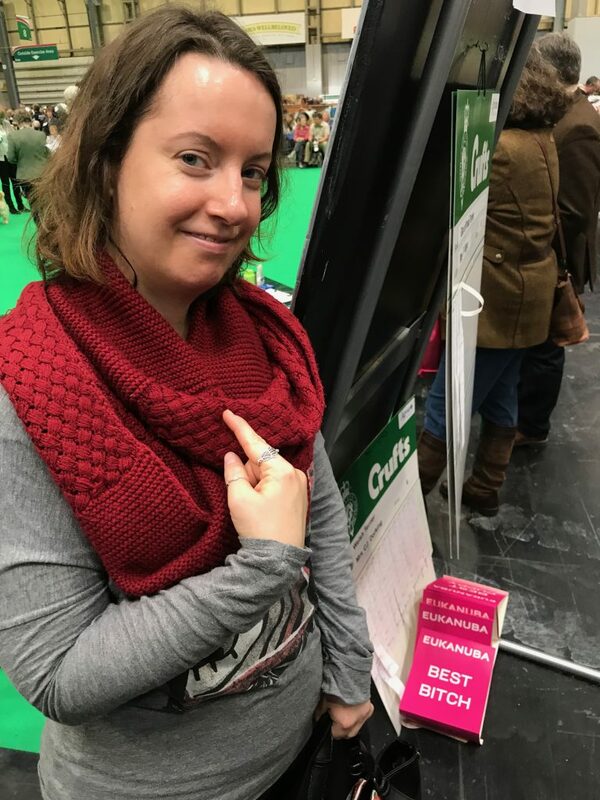 Something about recognizing excellence in breeding. 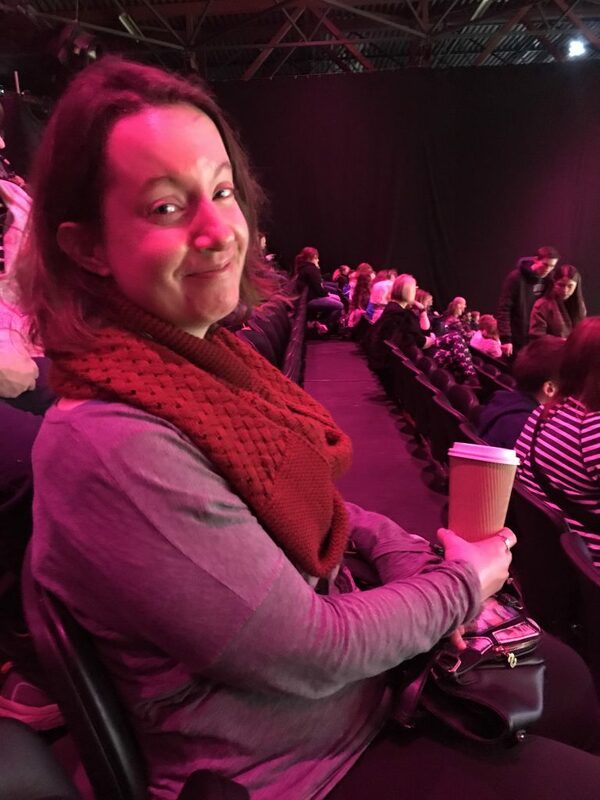 Do note all the different identical groupings in the back of the arena as others enter. 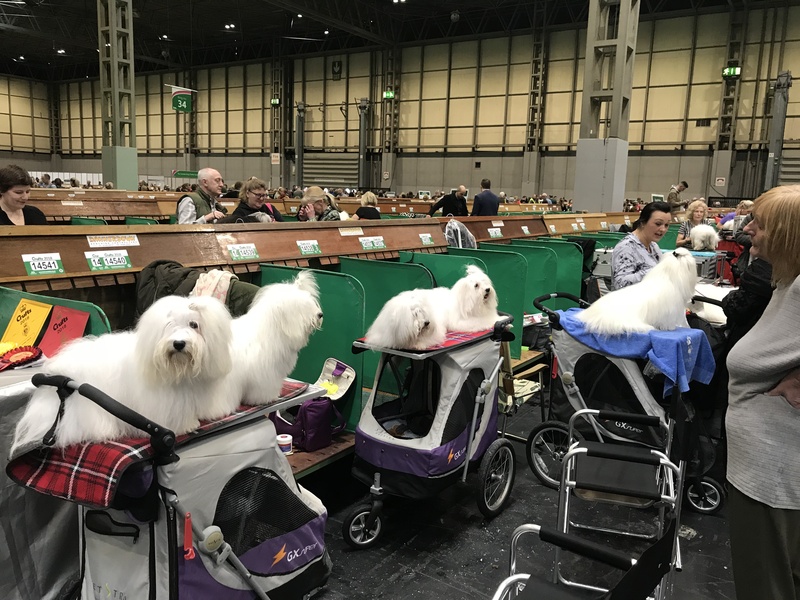 Again, part of the fun was seeing so many identical dogs at the same time. 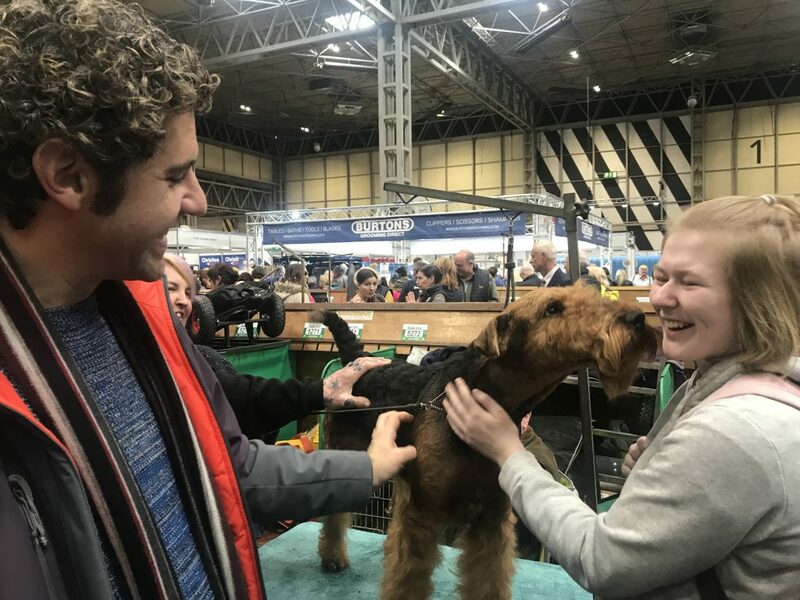 We will leave concerns about the world of pure-bred dogs for another post. 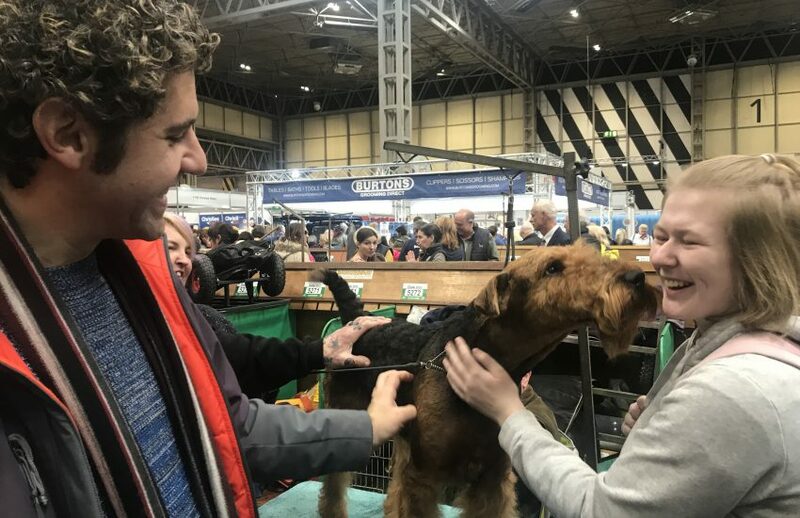 We are all for adoption and against cruelty to all animals, yet we also appreciate the variety of dog breeds out there, recognizing the role that devoted breeders have played. 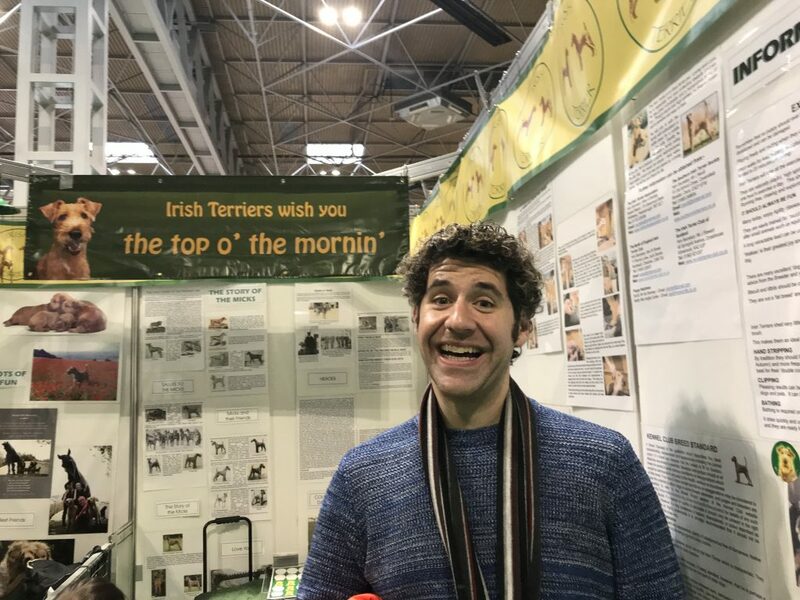 It is also fascinating to think about the original working purposes almost all of these dogs were bred for, versus the companionship that we seek from them today. 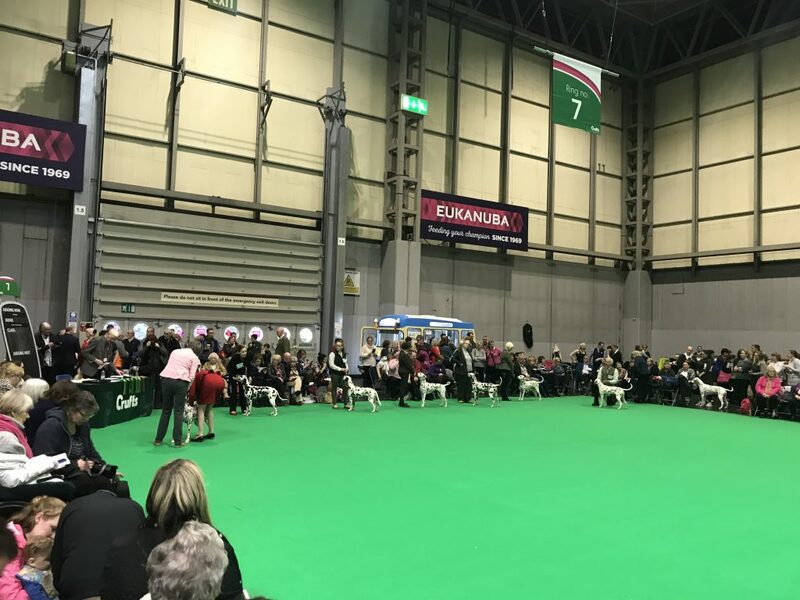 Bedlington Terriers! A champion ratter despite those lamb-like looks. 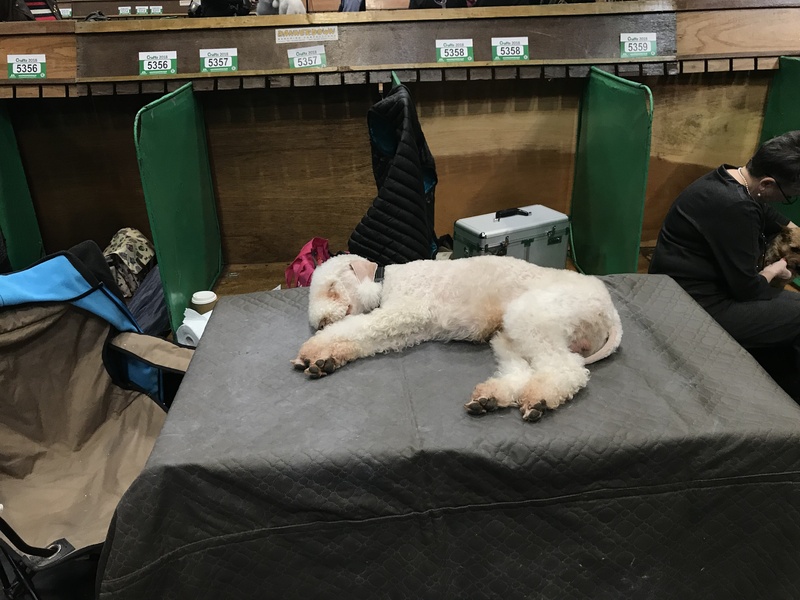 We may have found a new mutual favorite breed: the wire fox terrier. It combines that “Buddy” aesthetic with a “Latte” size, producing a spunky personality of its own. 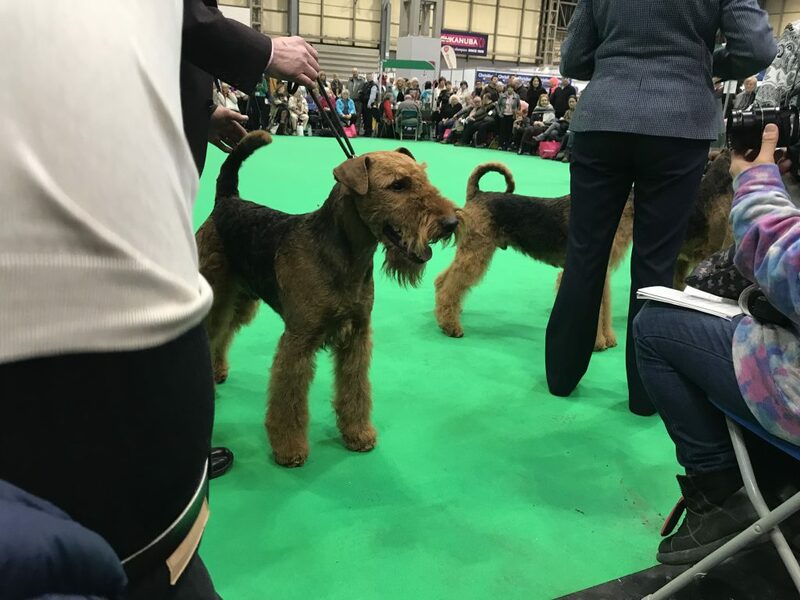 The rarity of some of these breeds makes it astounding to see not just one (which in itself in public would be notable), but a whole group of them at the same time. 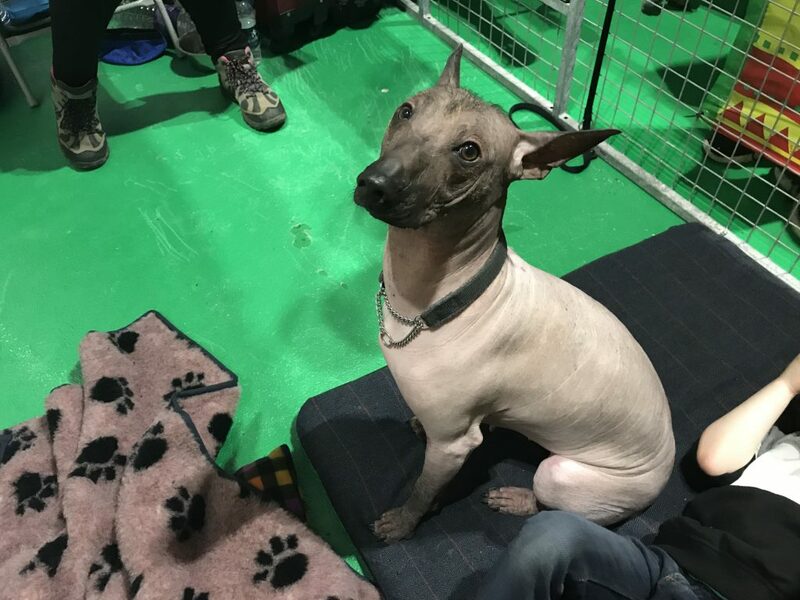 Behold, the Hairless Chinese Crested. 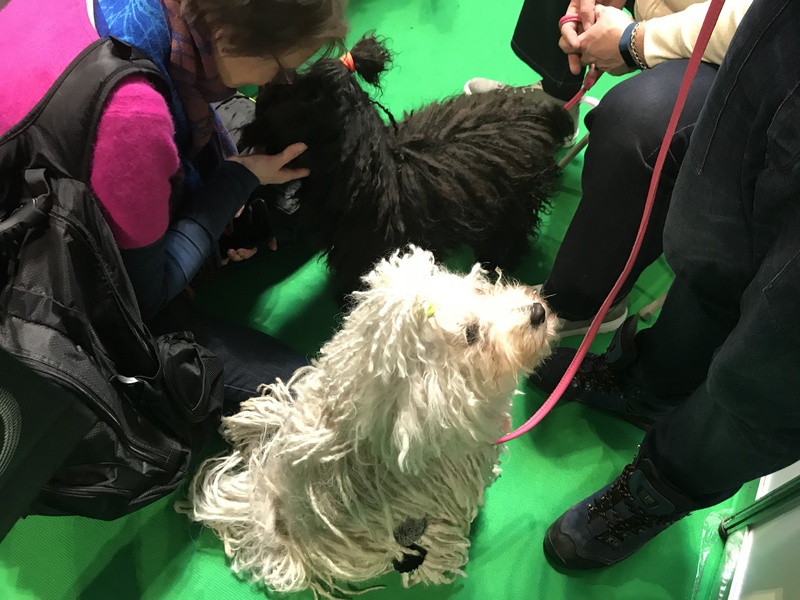 Dandie Dinmont Terrier, known for – guess what? – its oversized head. 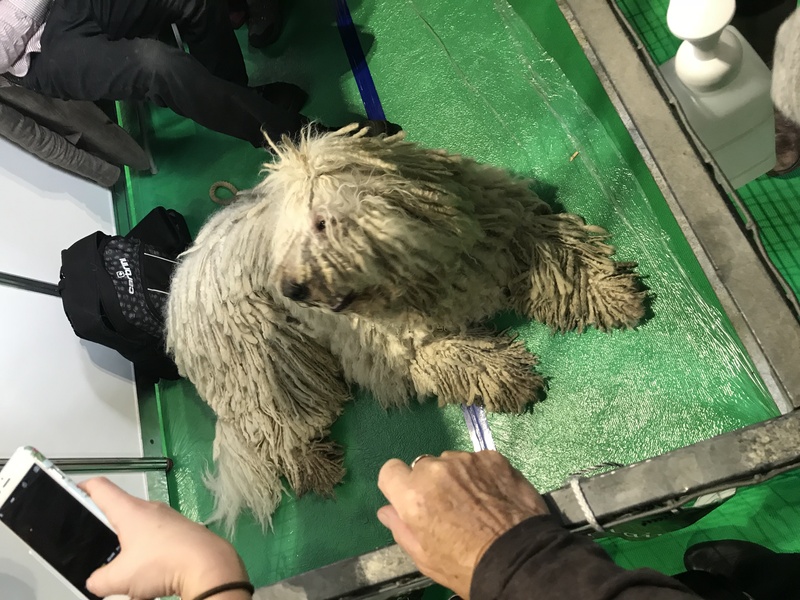 Komondor, a naturally corded herding dog from Hungary. 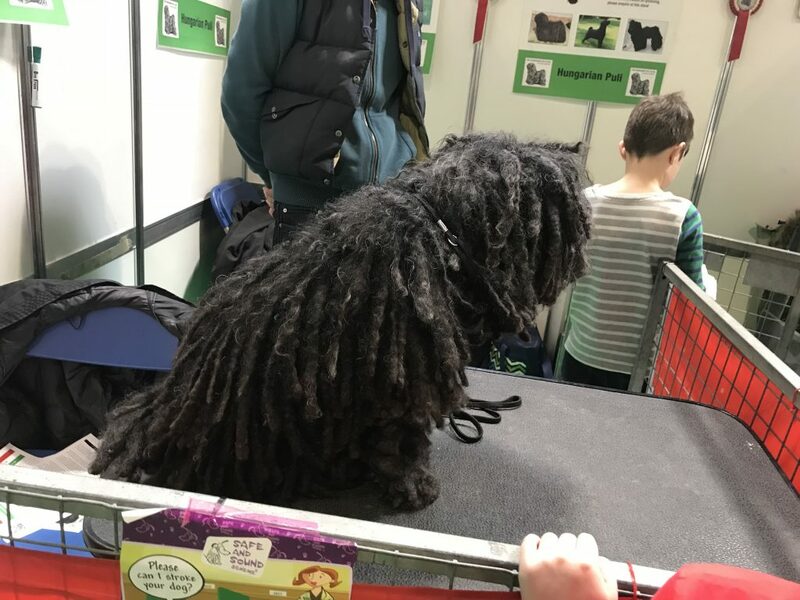 Puli, the Komondor’s smaller, blacker cousin. Fun fact courtesy of years of watching Westminster: the plural of Puli is Pulik. Though there is only one Puli in this picture. And a few random cute dogs for good measure. Did someone lose an Afghan rug? Sleepy Bedlington after a hard day. 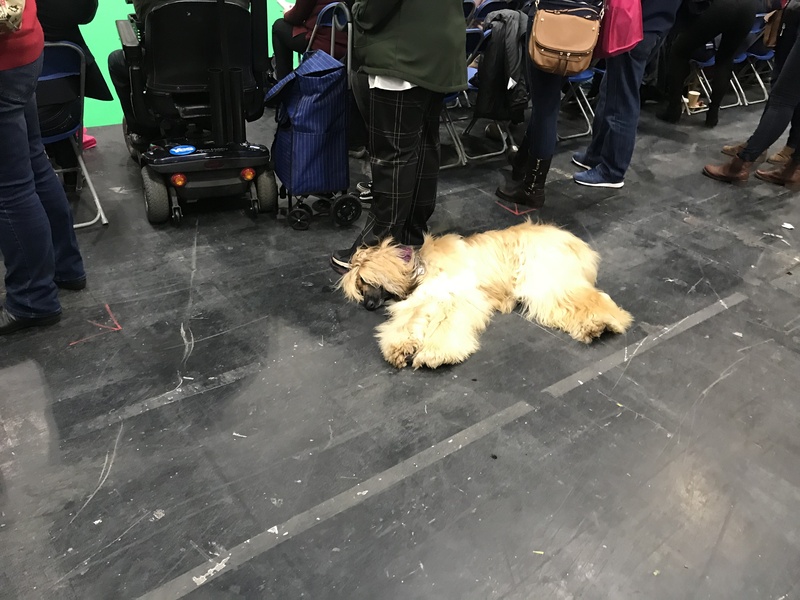 A massive dog show like this really seemed like an exhausting experience for all the canine participants. 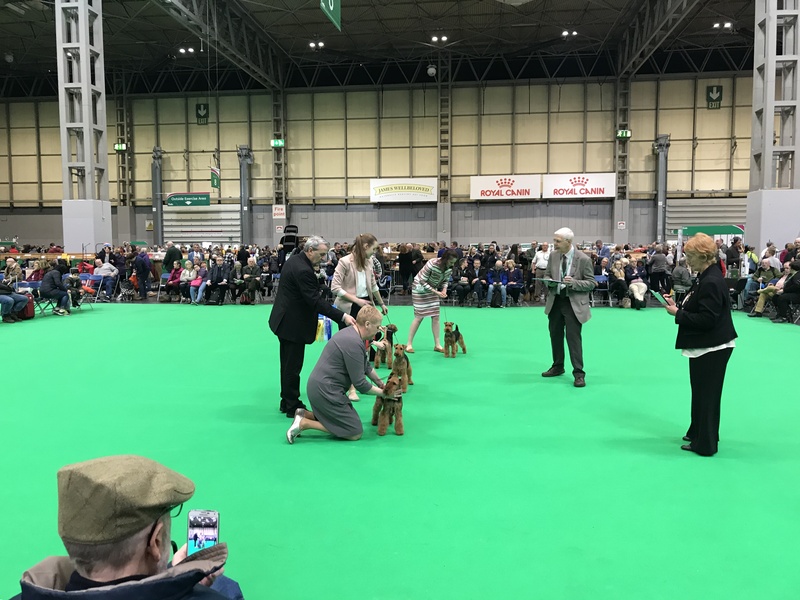 While it was fun from a spectator’s perspective to see all of the different dog breeds, it was clear that none was in its element. 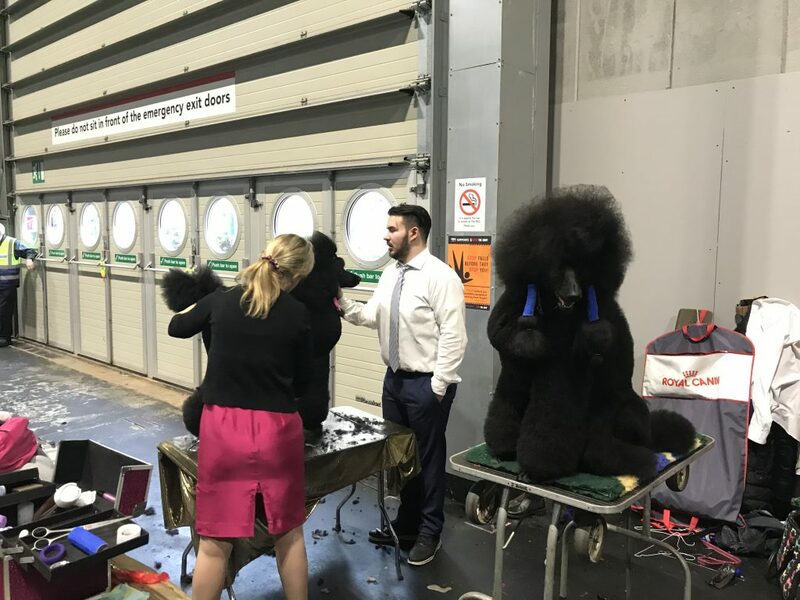 The constant primping and preening, lack of exposure to the outdoors, sensory overload, pressure to perform… so many factors combined to make it clear we were just getting an overhead view of the dogs’ personalities here. 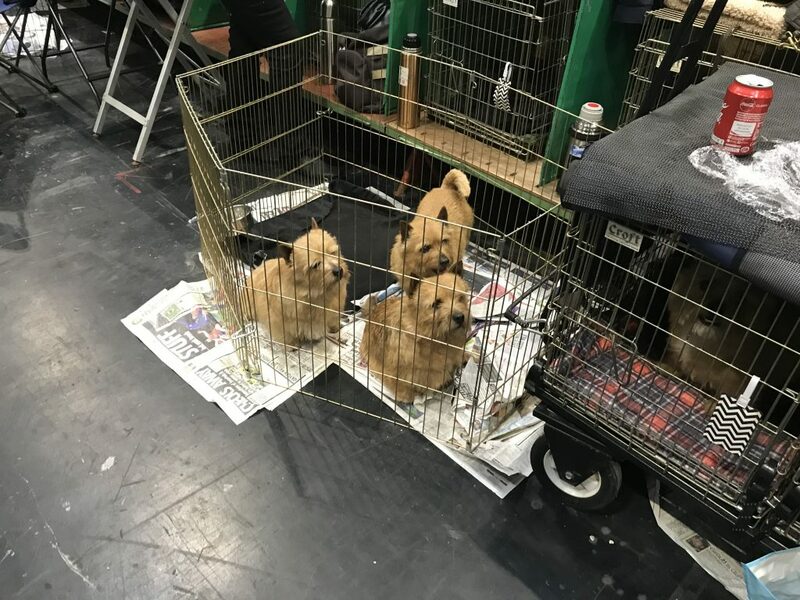 We hope, outside of their show careers, all have plenty of time to just be dogs. (Half) “Latte” hairdo. It ain’t easy being beautiful. 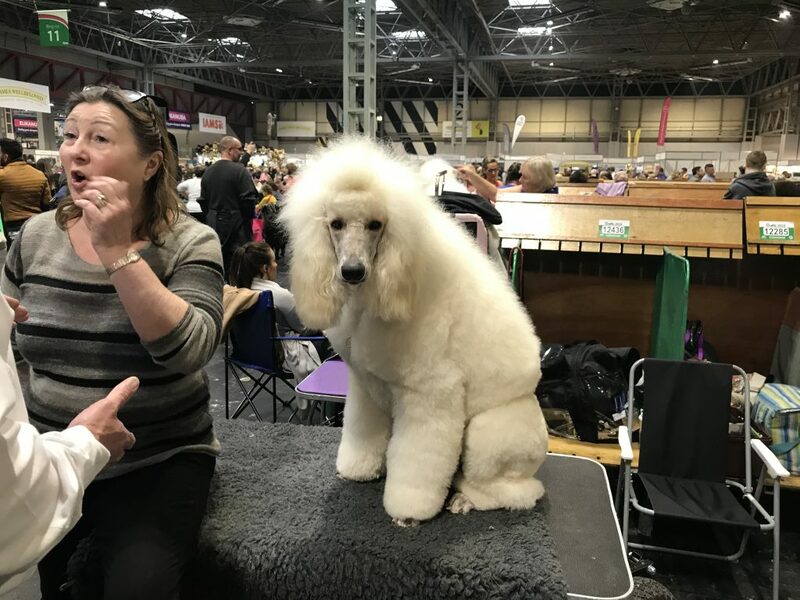 It was clear the Poodles had the most demanding grooming needs. 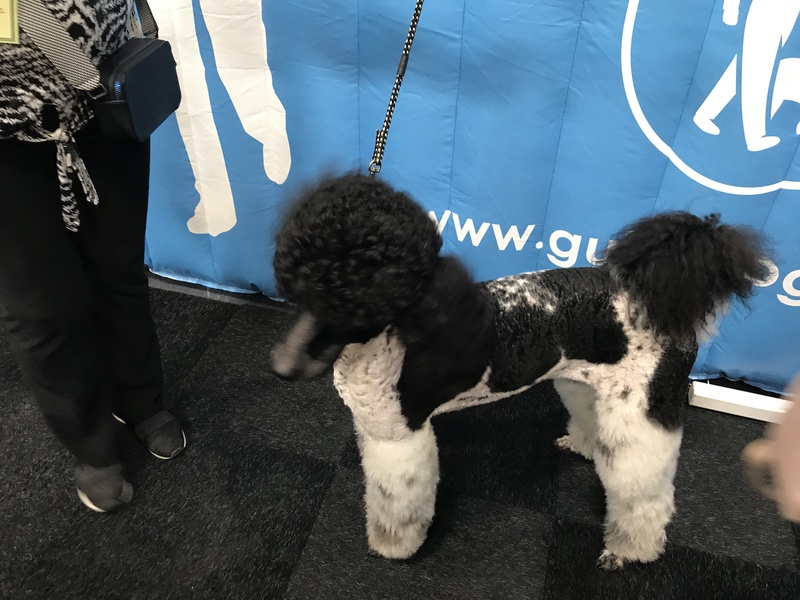 Tuxedo Poodle! Who knew these existed? 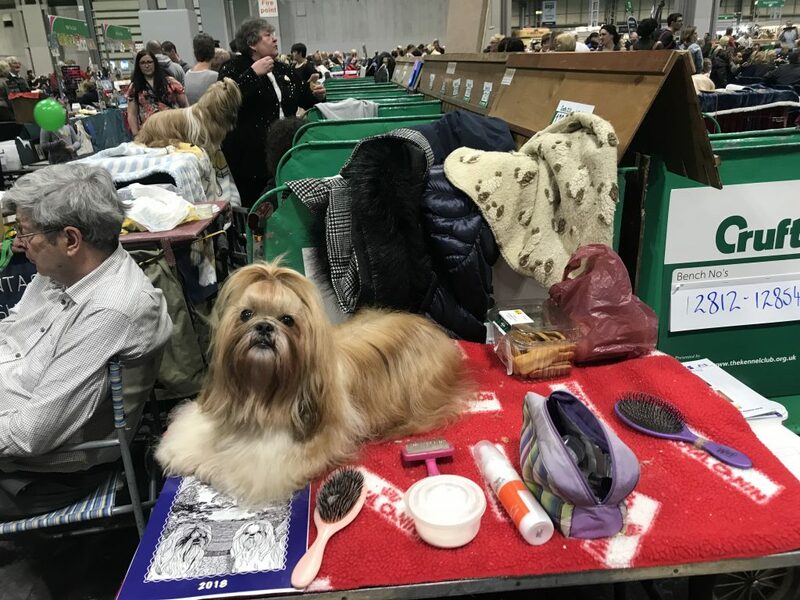 As the movie Best in Show proved, there is some comedy to be had in a dog show as well. 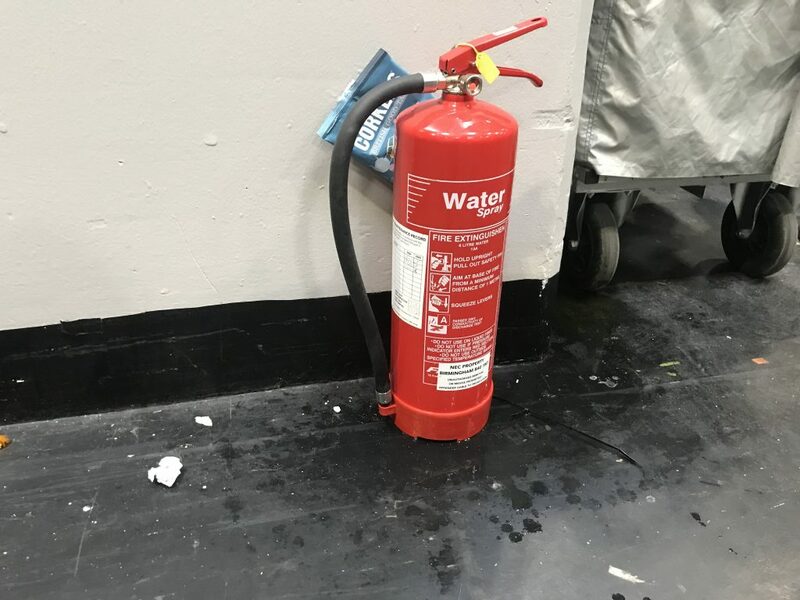 One particular week a year, it’s tough to be a fire hydrant in this expo hall. Yup, that’s really how you ask in British English. 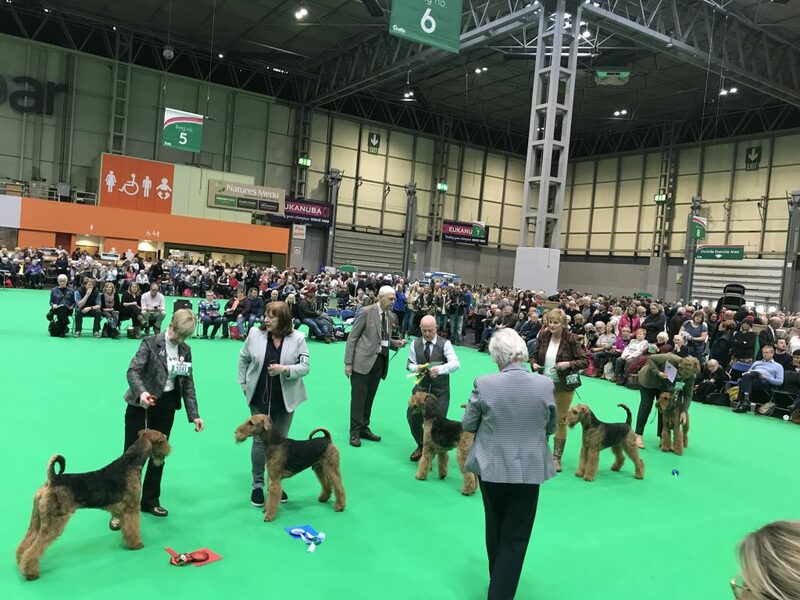 Eventually, the winners of each breed go on to compete for Best of Group and Best in Show. 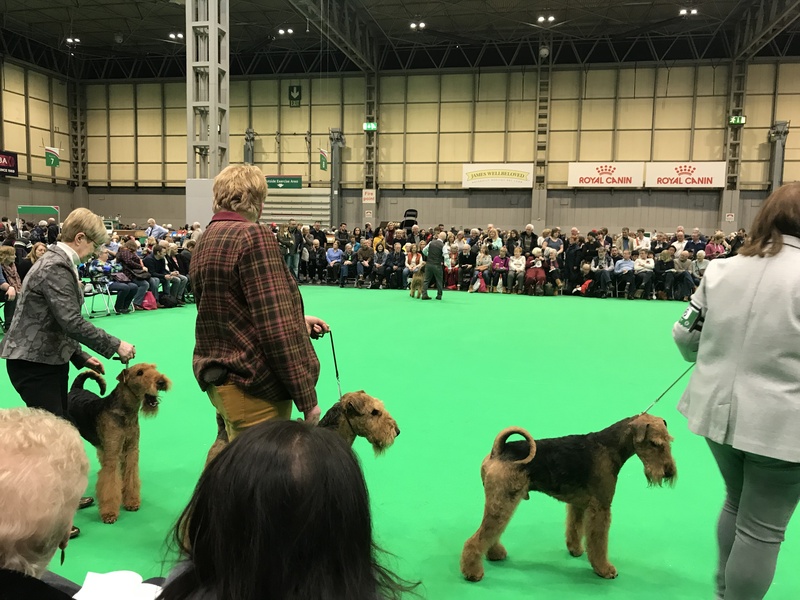 We went to see the best of the terrier group later the same day, starting with the presentation of the breed winners and rooting for our favorites again. The Scottie won Best in Group, but a few days later it did not win Best in Show. In the same arena during the day, they held agility demonstrations, which were equally fun to watch – whether the dog was really good or really bad. Here are some examples of both. 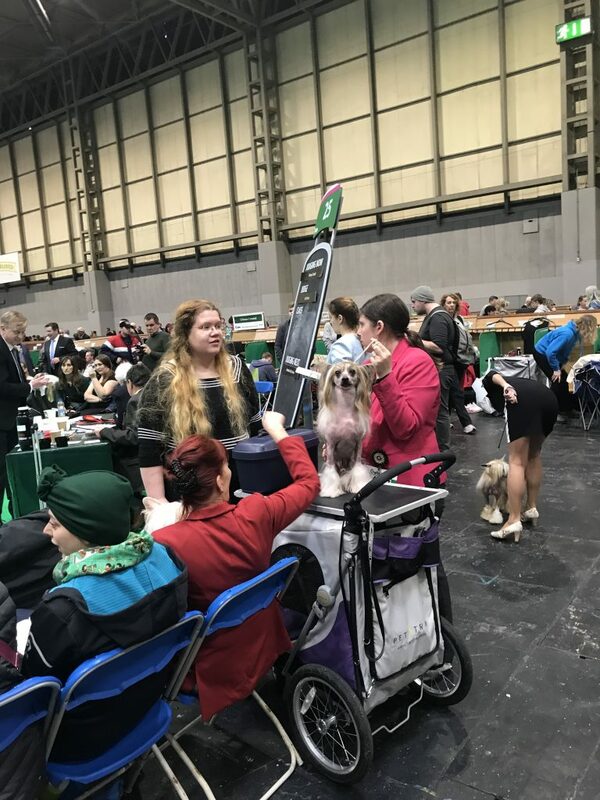 Anyone who thought a terrier would be great at agility clearly had never owned a terrier. By the way, Dreamer was not having any of these snarky comments about faults or eliminations at the end of the above video. 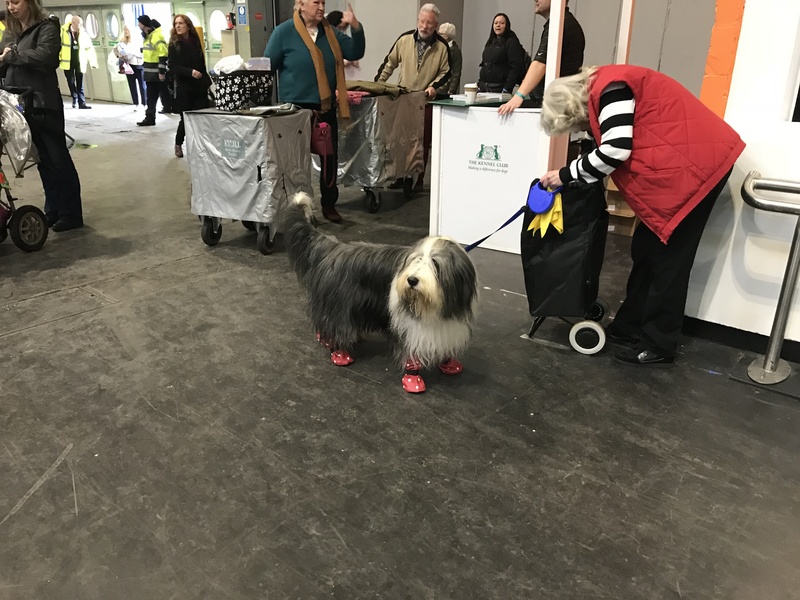 These dogs were all winners in our book. 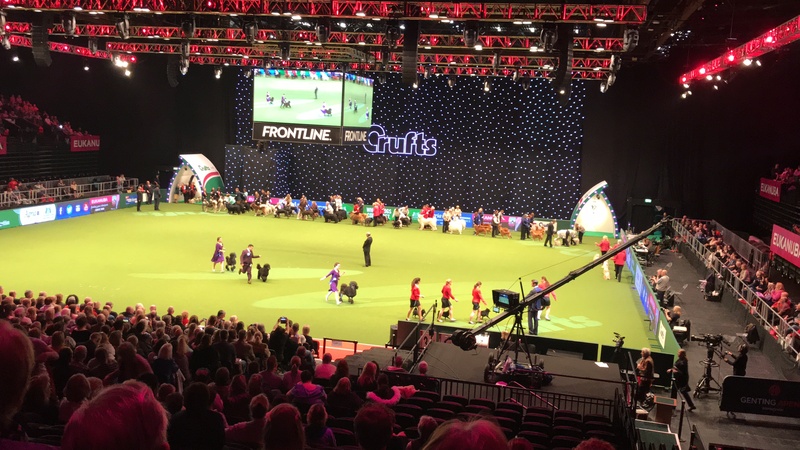 And speaking of real winners… Leave it to the Border Collies to dominate this sport. And to the British to do commentary right. Loved this post! Will come back to it again! Love you!